MURDER OF A GAMEKEEPER NEAR LEEDS. Leeds Mercury. Saturday 1 March 1873. Last evening Mr. Taylor, coroner for the district, held an inquest at the Old Masons’ Arms, Oulton, Woodlesford, near Leeds, respecting the death of Edwin Lambert, 42 years of age, who for upwards of eight years had been head gamekeeper to Mr. Edmund Calverley, of Oulton Hall, Woodleeford, near Leeds. On Tuesday evening last the body of the deceased was found in the River Aire, near Fleet Mills, a short distance from Oulton. The deceased, who resided at Royds Green, Rothwell, was a married man, and had previously been in the service of Capt. Stansfield, of Flockton, near Wakefield. He was generally known as a quiet inoffensive man, and highly esteemed in the neighbourhood. Leaving his home for the purpose of a wild duck shooting on Tuesday night, the deceased walked along the river bank, near Fleet Mill, a distance of about two miles, having previously arranged with his under gamekeeper Edward Gillings, to meet him. Gillings was accompanied by his brother, Joseph Gillings, a quarryman. Soon after the deceased had taken up his position on the banks of the river shots were heard by the Gillings (as stated by them at the inquest last evening), some of them being in very rapid succession, and seemingly not permitting of the necessary time to load a double-muzzled loading gun, such as that which the deceased was using. Lambert was subsequently found lying in the river, the left side of his head, face, and neck being fearfully injured by shot. The first intimation of the discovery of the body was by the brothers Gilling, who had been occupying stations further along the bank of the river on the same side as that where the deceased was stationed. Some slight quarrel had, it was stated at the inquest last evening, taken place between the deceased and one of the Gillings. Mr. Taylor opened the inquest on Wednesday, when, after calling Mrs. Lambert, the widow of the deceased; George Tate, a lock-keeper; and Charles Thompson, an ex-policeman, who spoke to the finding of the body, it was adjourned until last evening. Mr. Christopher Jewison, surgeon, Oulton, was the first witness called. He said that, on making a post mortem examination of the body of the deceased, he found externally gun shot wounds on the left side of the head, face, neck, and superior portions of the chest. The bulk of the charge of the shot that would have a fatal result was about an inch behind the left ear, fracturing and completely penetrating the bone. Another portion of the shot diverged from the bone, piercing the muscles of the neck, the track admitting the entrance of the finger to the depth of three inches. In witnesses’s opinion the gun must have been more than four feet from the deceased when it was fired, on account of the large surface covered by the shot. It was exceedingly improbable that the deceased could have inflicted the injuries either accidentally or intentionally. Witness asked if he had a gun when the body was discovered, and he answered, “Yes, I had a gun.” He did not say what distance he was from the deceased. They called out “Lambert” several times, and the deceased’s dog came rushing towards them. After they procured a light, the dog was found sitting upon the body. On Saturday night a man, named George Clayton, was in witness’s house, and spoke of the disturbance between the Gillings and the deceased, and said that they were as good friends as ever. Police officer George Herd, stationed at Oulton, stated that he was first acquainted by the Gillings of the occurrence. Edward Gillings said, “We have had a bad job; Lambert has either shot or drowned himself.” He said that the body was in the river, but that they did not like to do anything with it themselves. A conveyance was got from Oulton Hall, and the Gillings, a coachman, and witness afterwards got the body out of the water. There was a mark on the bank in the snow as if the body had slipped into the river. The gun of the deceased was found close to the river bank; the left barrel was not discharged. The Gillings said that they had often cautioned Lambert about loading his gun with the hammers up. Witness produced the clothing, gun, and a wild duck found on the body of the deceased. He also heard Edward Gillings say that he and his brother had made an appointment to meet Lambert on Tuesday at his home at Rothwell, to go duck shooting, but that they did not go, making direct to the river. On the 12th inst., witness added, that he was on duty in Oulton. He saw the deceased, Edward Gillings, and a man, named Ramsden. Lambert was a little intoxicated, and Gillings had been drinking, although he was not very drunk. Lambert asked witness if he would go home with him, and witness walked along the road with him. Witness had a heavy logwood stick in his hand, and when in the Park asked the deceased to try the weight of it. The deceased did so, and allowed the stick to fall upon a dog which Gillings had with him. Gillings got into a bad temper, pulled off his coat, and wanted to fight the deceased, and witness offered to fight both of them. Gillings afterwards said that Lambert might use the policeman’s stick, and he would use one that he had in his pocket. Gillings ultimately went away, and the deceased and a man accompanying him, named Ramsden, went into the house. Joseph Gillings, Low Green, Rothwell, quarryman, stated that he had known the deceased about seven years, and had acted as occasional assistant to him since he came to Oulton. Tuesday being a stormy day, and Carlton Feast, witness went home and remained there until after dinner, when he saw the deceased. Lambert had a pig to sell, and they went to Carlton and sold it for 42s. The deceased afterwards asked witness to join him and Edward Gilling (witness’s brother) in duck shooting. Witness agreed to do so. Witness and his brother started night, each having a gun, witness carrying his in his pocket. They sat down near a goit turning a mill. There was no one there when they went. They seated themselves in different parts of the goit, and remained there for about two hours. Witness heard a shot fired, he should think, before Lambert had had sufficient time to get to the place where they afterwards found him. Another shot was heard in about a minute after, apparently from the opposite side of the water. About a quarter of an hour afterwards they heard another shot, followed by another in less time than witness thought any one would have time to charge. Witness’s brother was about forty yards distant, concealed behind some willows, and when it became so dark that they conld not see anything flying, witness moved down to the place where his brother was lying. He asked him where Lambert was, and he replied, “I don’t know; he has gone down, and I expect him coming up directly.” Witness added that he then went off to look for the deceased, and failing to make him hear, after whistling, came back to his brother, and told him. His brother replied, “He has never left me so before.” His brother then left his place, and accompanied him down the river side. They called several times, but received no answer. Witness said that he and his brother, on getting to the spot where they expected to find the deceased, saw what they thought was the body standing upright in the water, but which was subsequently found to be the trunk of a tree. Edward Gillings, brother of the last witness and under gamekeeper to Mr. Calverley, of Oulton Hell, was next examined. He said that he was in the habit of meeting the deceased at his residence every morning except Sunday morning. He met the deceased on Tuesday at ten o’clock. Usually they met at Lambert’s house at half-past nine o’clock. In some conversation witness had with the deceased he told him that his brother was with him, and concealed in some willows. Witness simply corroborated his brother’s evidence. OLD TOMBSTONE THAT TELLS A STORY. Yorkshire Evening Post. Friday 26 August 1938. 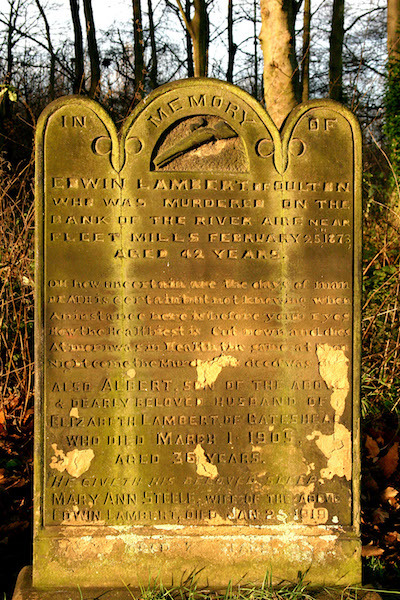 Edwin Lambert of Oulton, who was murdered on the banks of the River Aire, near Fleet Mills, on February 25, 1873. This inscription appears on a headstone in the churchyard of St. John’s Church at Oulton. Above is an engraving of a gun. The dead man, a gamekeeper, was killed in a poaching affray, at the age of 42. His murderer was never brought to book, but local opinion (as usual) pointed the finger of suspicion. It was said that, when the victim of suspicion was on his deathbed years later, his mother snatched the pillow from his head to prevent him confessing with his last gasp. How the recounter of this incident knew how the dying man intended to use his last gasp is not explained. DEATH is certain, but not knowing when. An instance here before your Eyes. How the Healthiest is Cut down and dies. Morn was in Health, the same at noon. Night came, the Murderous deed was done. 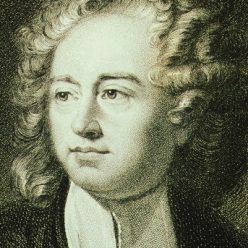 “Old John Poole was sexton 38 years, and his father before him. He would have told you many reight tale. He had a spade which he said belonged to the old body snatchers. “Body snatchers in the graveyard, and poachers just outside it, startled each other one night, so that the poachers ran away leaving their nets and tackle, and the body snatchers left their ropes attached to a coffin. The sexton pointed to another headstone. Inscribed to the memory of “Mr. Matthew Kitchen,” who died in 1845 at the age 52 . Here were the tops of four stone stumps sticking out of the ground. They were arranged in the form of a rectangle a few yards long. “D’you know what’s buried here? Windows. Windows out of the church – stained glass that was replaced by pictorial windows 50 or 60 years ago. “One of the Calverleys of Oulton Hall said he would not have the old windows put to any other use, so they were buried. “The Calverleys’ tombs are under the chancel. I’ve been down there a time or two. Its a funny place to get to, but there’s nothing much to see, only one or two oven-like affairs. “I’ve known oil lamps, gas and electricity in this church – and I’ve known it robbed twice. “That’s the window they got in by the first time, but all they got out of the box was 10 1/2d. and a post-dated cheque for 6 10s., which didn’t do them any good. D’you know, those fellows robbed 40-odd churches before they were caught. “I thought he had a ‘bit of cheek.’ particularly as the floor was littered with matches he had struck to find the switch, but he seemed genuinely interested in the church, so I showed him round. Then I went to attend to the fires, and he went away. I just happened to wonder if he had closed the door, and went back to see. Then I noticed the box missing from the porch. I ran towards the gate and saw him fastening the bag at the back of his bike, but as soon as he saw me he mounted and was off.